A day off (yes, a weekend day...holy cow). Good weather. Adventurous Spirt. This calls for a hike outdoors! There are three places that I've heard people mention that are nice for hiking: Skinner Butte, Spencer Butte, and Mount Pisgah. I opted for Skinner Butte since it was a shorter hike, free parking, and good views of the city. I put on my sunglasses, grabbed my camera, and jammed. My handy navigation system, brought me to the park. A good start. Then I had to ponder: should I bring my jacket? I made the right decision there - turned out warm and sunny. 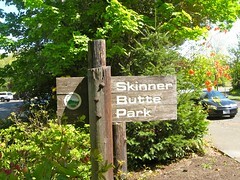 At first I wasn't sure where to go since there was a bottom park. Where was the trail head? I decided to just walk and if I saw a break in the woods, uphill area (aka the butte) then I'd break for it. Finally, I found an entrance. Up I went! The hike - okay, I'll be honest, it's not a hike, more like a power walk - was quite nice. I stopped and smelled the flowers (not literally). Along the way, I snapped a few photos, pretended I was Bella in Twilight (dork), and then just enjoyed the birds tweeting and the fresh air. I encountered some strange people too (remember this is Eugene). Some guys were carrying bags and a net, catcher pole. I asked what they were doing - why not? And they were apparently looking for bugs as a school assignment. 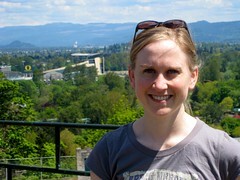 I also got a guy to take some pictures of me at the top where there was a view of the U of O Stadium. We chatted about digital photography a bit. I really can't contribute much to this topic yet, but I was able to say stuff like, "why, yes this is the age of digital for sure." Did I mention yet that I'm a dork? I hung around the butte top a bit, then headed downhill. It only takes about 10-15 minutes to get to the top (or bottom). I realized once I was on the top, that you can drive. Lame. Anyway, at the bottom is the Willamette River. Also, I saw some random people biking, soaking up the sun, play with kids, or throwing frizbees. On the way home, I detoured to the Saturday Market. The Saturday Market is a huge outdoor market during the summer. There is food, art, crafts, jewelry, music, and all sorts of interesting hippie stuff. I returned home somehow smelling of incense (Josh noticed too). That's it. I came back, posted photos, and wrote this entry. A nice little outing. Note: Josh is going crazy studying for finals. Perhaps I'll write a post about him and his studying this week.